Njabini, Kenya, January 28, 2019 – Mass Baptisms have become somewhat commonplace in Africa in the past few years. The latest joyous news comes from the St. Barnabas Orphanage and School in Njabini, Kenya, where 13 children were united to Christ in holy Baptism on Saturday, January 26. A video posted on the orphanage’s Facebook page shows Fr. 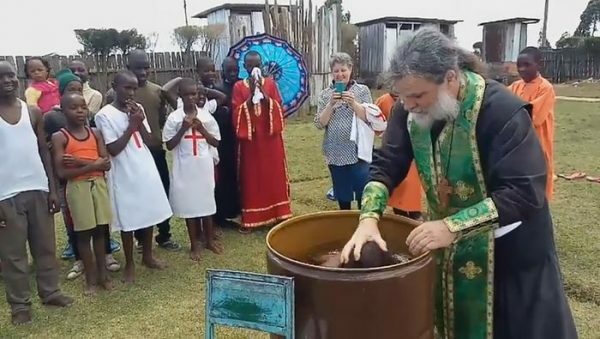 Seraphim Holland of St. Nicholas Orthodox Church (ROCOR) in Mckinney, Texas baptizing the children in an oil drum. Fr. Seraphim and his wife Matushka Marina arrived in Kenya on February 23 to teach, baptize, and fellowship with the children of the orphanage. Two mass Baptisms in the Congo in late December brought 117 people into the Orthodox Church. OrthoChristian also reported on 11 children being baptized at St. Barnabas’ in May 2017, and 35 at the St. Irene Orthodox Mission in Orphanage in Kenya in February of last year. St. Barnabas Orthodox Orphanage and School is a Child-Advocacy Ministry that pairs able people with those who have been hit by the wave of poverty. The organization helps the needy children from spiritual, economic, social, and physical poverty to new horizons of hope. Their goal is to enable these needy children to become responsible and fulfilled Kenyan citizens in the future with dignified lives. The undertakings of this organization have grown from modest beginnings when Rev. Father Methodios J.M Kariuki felt compelled to help 13 orphaned kids who were going through straited circumstances in Njabini, Kenya, and I am hopeful that he is going to reach a spectacular height of organizational success in his objections with a focus of giving these children a life of success and dignity. Today, their number has increased tremendously and there are over 300 children who have benefited from this noble project and are now reaping the broad benefits of one man’s clear, God-given vision.